Detailed information on character creation, horror-themed series, and adventure design. A complete system for building your own supernatural menaces for your heroes to hunt (or to hunt them...). New hero and villain archetypes like the Curse-Burdened Adventurer, Noble Monster, Dark Emissary and Inhuman Juggernaut. ARCADE (American Research Centre for the Arcane Defence of Earth), a new organization whose agents wage a secret war on the horrors that lurk in shadowy places. 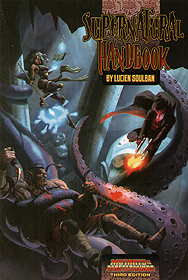 Join the fight against ancient evils and occult menaces with The Supernatural Handbook! You're Not Afraid... Are You?